Med Transport Center has been transporting patients for the over 30 years and have gathered many safety tips to benefit seniors and their families for a stress-free ride. The first in tips we have gathered is what to bring? There can be a number of medical and non-medical emergencies that may arise when traveling, especially if there is a pre-existing condition. The best way to handle these emergencies is to prepare prior to boarding and provide all the necessary information to Med Transport Center staff so they can prepare their drivers and nurse as a precaution. Med Transport Center’s main goal is to make sure the traveler is safe and feels safe, comfortable and at peace throughout the entire trip. There are at least 5 important items to bring for a long distance non-emergency medical transportation. Change of Clothes, Jacket or something comfortable to wear during your trip. Make sure to have your closest loved ones’ contact information on your person. This makes it easy for your driver, doctor or even you to contact your family or regular caretaker to check in if needed. It’s helpful to have this information clearly written down somewhere outside of your cell phone. It’s best to have all your contact information pre-loaded into your cell phone as well with a fully charged battery and charger. Friends and family may want to contact you, especially since you are traveling long distance. Med Transport Center, offers the ability to check in with your loved one or the licensed nurse can help you make contact with your loved one’s on a regular basis over the phone to check in and provide updates on the traveling to your destination. A cell phone will provide you a way to call your loved one and report anything important that comes up during your trip. Depending on the duration of your scheduled trip, it is important to bring your medications and other essential items. Keep a list of medications and dietary supplements with a detailed list of when you take them so the nurse can help administer when scheduled. Also, if you enjoy reading, bring your favorite books and reading glasses. Or remember to bring lotion, eye drops, or anything else you typically use to help make the trip more comfortable. Our drivers and nurse are more than happy to help patient feel they are in a comfortable environment and try to accommodate as necessary. Med Transport Center strives to bring a home like environment and will supply water and can accomodate stopping for meals. If you need certain snacks, make sure you request them at the time of the reservation or make sure you bring snacks to help maintain your energy throughout the trip. Also, make sure you drink enough water so that you remain hydrated the entire time. We have even had some clients bring their pet to travel with, but make sure you bring a carrier, pet food and any other important items. Prior to reserving your trip, please provide us your list of needs when scheduling your trip. If the trip will be cross country, remember to bring a change of clothes and even a backup set just in case. Also, don’t forget a jacket! Even if it’s warm at the start of your destination when you leave, it may be cooler at your destination. Or, if it is cooler at night, a jacket can help to keep you comfortable and warm during the entire trip if needed. 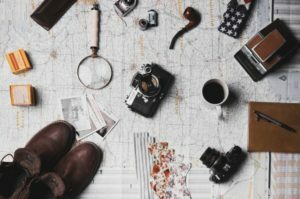 If the transport is for the purpose of relocating long-term, you will probably want to bring along some items of sentimental value like family photos, trinkets, and memory books. 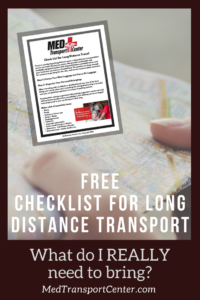 This can help pass the time during your long-distance transport, as well as, provide a safe spot to keep them with you during the duration of the trip. Our transportation service is designed for anyone who has increased medical needs or limited mobility, including the elderly, disabled, or even those who are just needing a little assistance during their travel. MED Transport Center is dedicated to providing a safe, comfortable journey with each ground or in flight transport. Each transport is medically-equipped for non-emergency transports, offers 2 professional drivers, a licensed nurse and offers an emergency physician in case the need arises. Furthermore, our utmost priority is to make sure that your loved one will safely get to his or her destination.